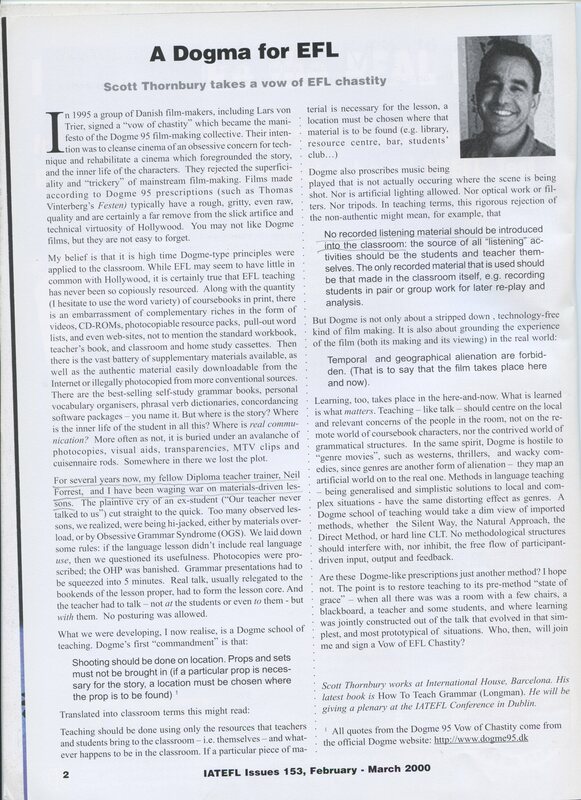 It’s ten years now, since Scott Thornbury wrote his brilliant, funny, and provocative ‘Dogma’ piece in IATEFL Issues, as it then was. And it WAS a brilliant piece, only one page long, capturing a little slice of the zeitgeist and encapsulating, at the same time, an issue about a depressing over-reliance on materials and grammar teaching. I have it here in front of me. In case you haven’t actually read it, Scott describes how the Dogme film makers in Scandinavia have signed a ‘vow of chastity’ in which they eschew the use of special effects, lighting, music – indeed anything which constitutes the ‘artifice’ (= technologically-mediated pretence) of filmaking. Everything has to take place in natural light, in natural time. Along the way they (the filmmakers) also take time off to rail against genre films – westerns, thrillers etc. Who then, Scott asks, will join me and sign a similar Vow of ‘EFL chastity’? Lots of people as it turned out. But not me. Count me out. Not my style at all! And here in my own little short blog post is why not. First, be careful who you choose to use for your analogies! The Scandivanian filmmakers kept their vows for, oh, well about two or three films. And then they suddenly realised (duh) that music, lighting, tricksy editing, precisely all the artifice of film-making REALLY WORKS. Think of the immaculate and moving scene in one of my most favourite recent films (El Secreto de sus ojos) where the train pulls out of the station leaving the heartbroken woman behind on the platform; it is tear-jerking and genuinely artistic and relies on different cameras, re-takes, lighting, music, editing and re-editing. What about the amazing single-tracking shot in Atonement where all the artifice of film-making (and an incredible score) makes the scenes at Dunkirk beach totally and horrifyingly compelling. I could on forever, but this is just to say that for every Avatar (which turns even me a bit Dogme) there is a Death In Venice, City of God or Slumdog Millionaire! One of Scott’s claims in his article is that ‘learning takes place in the here-and-now’. And the thing is that I am not sure this is true. Learning takes place in a learner’s brain and there is no guarantee that this happens ‘here and now’, and that it happens because of and during dialogic interaction. Not all students’ brains process what they are doing in the same way. Some of them take time to process things, and that time might be then, not now! Dialogue – and the relentless pressure on students to speak RIGHT NOW when the teacher asks them to (a basic pillar of communicative methodology) – disadvantages some students enormously, it seems to me, and he idea that all learning comes through interaction just doesn’t stack up in my mind. Some of us are thinkers, some of us are doers, in other words. Most of us, of course, are a bit of each. But (and this is my point) for every student whose language emerges through relevant and meaningful dialogue there is at least one other who benefits from an internal struggle when lectured to or when reading prescribed texts. To suggest that unplugged teaching is necessarily superior in some way is to claim a direct understanding of (and route into) all students’ brains – and none of us have that. Let’s go further; of course I get a lot of my knowledge and understanding through conversation and contact with others in true dogme style. My life and my learning would be barren without it. But I also get a lot of my knowledge from reading books, listening to things, watching movies, going to lectures, finding things on the internet, playing with apps and artifice-driven software and doing it all on my own! The dialogue (probably not a very elevated one I will admit) is with myself and happens in my own brain! It is of course easy to make fun of coursebooks and ‘grammar mcnuggets’ (another of Scott’s fantastic and thought-provoking analogies), but I think it is also possible to view them in a more benign light. Something like this: if we believe in equal opportunity then we might argue (the emphasis there is on might!!) that offering pre-digested grammar actually meets that claim far better than a methodology which advantages the more extrovert, communicative and emotionally intelligent of our students. With grammar mcnuggets everyone at least has equal access. Can we be sure that that this is the case in some more student-driven pedagogy? Which students in a group are we talking about, by the way? In a class of 60? Hmm. So I’m not going to throw away my coursebooks or my technology. I am not going to throw away the artifice of teaching. Not unless I am a lot more confident of my own wisdom than, in fact, I am. So what do I believe in? 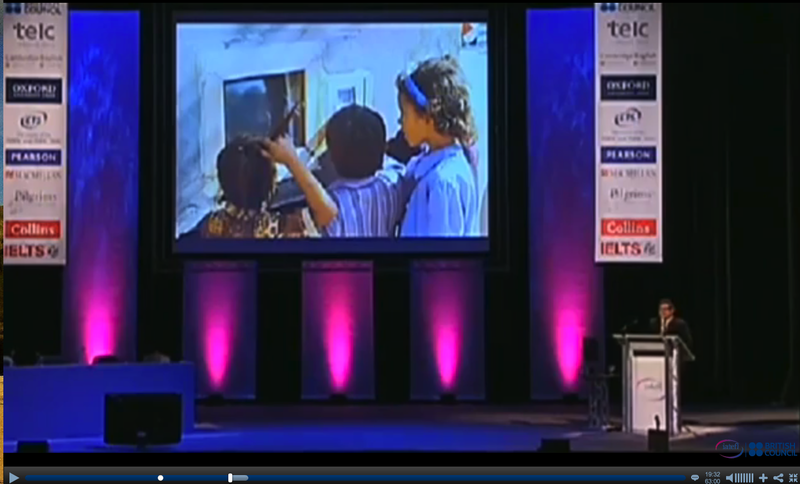 I believe in the richness of techniques, approaches, materials and artefacts available to the modern teacher. I believe that an over-reliance on any of these to the exclusion of others is unattractive and unlikely to be in the best interests of all. I believe that everything – in a classroom – has to be grounded in the expertise of a teacher being able to find the best way of doing things for the benefit of (and with the help and guidance of) the greatest number of students. And often that may be unplugged, but there is no guarantee (or moral reason) why it should be. And sometimes that might be coursebook-mediated but there is no guarantee (or moral reason) why it should be. But then, of course, he was!